A traditional, yet relaxed all day sit begins at 9:00 am and includes meditation, a silent lunch, dharma talk/discussion. Will is also available for a private meeting (dokusan), if requested. Detailed instructions and the day’s schedule will be sent to you via email a couple of days before the retreat. Suggested contribution for the All Day Sit is $30.00 but this is not arbitrary, it is up to you to give what you can. There is no set fee. Please bring your own brown bag lunch, tea and coffee will be served. You may make a donation by cash or check at the sitting or via PayPal. 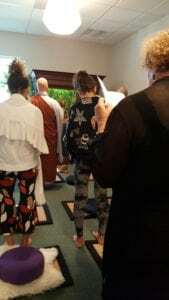 (Dana and Foundational Sangha Members who contribute monthly, need not make any additional contribution for retreats, workshops, or classes, as these are included in their membership). Please RSVP. Space is limited. We very much appreciate receiving your registration no later than the Thursday before the sit. Thank you to everyone that participated and may the Dharma be your guide in all you do!